What if we stopped wanting to be beautiful? All of my life, I yearned to be beautiful. Growing up as a fat little girl, born into a family where the women are gorgeous, my favorite fairy tale was “The Ugly Duckling”. One day I hoped I would transform, preferably overnight and sooner, rather than later into someone who was slim and beautiful and I would be the swan. If I was beautiful, I could have everything I wanted. I would fit in at home, at school and in a society that showed me everywhere what women were supposed to look like. I spent half my life pursuing beauty with the promise that the next diet would be “the one”. During my life, I have lost a significant amount of weight at least twice. Once it got me the title of “runner up Slimmer of the Year” complete with my story in a magazine and a set of professional photos that my Mother told me “made me look like I was a model”. I didn’t feel comfortable with my new found beauty. People treated me differently. I was congratulated, exclaimed over and got lots of attention. Some of it was positive but much of it showed me a side of people that I really did not want to see. Much easier and safer I decided, to be fat and invisible and just have a pretty face. My decision was perhaps, not quite as conscious as that but the attention, flattery and often sleazy behavior were so surprising and uncomfortable for an introverted soul who had spent most of her life believing that losing weight and finding beauty would be the answer to her every prayer. I discovered that losing weight only gives you a smaller body and that it didn’t magically grant confidence, self-love and happiness ever after. As I work with my clients now, this yearning to be beautiful and everything we attach to what beauty represents, is at the heart of so much of our self-hatred and self-criticism. Now the debate that I see playing out, partly as a rebellion against “thin is beautiful” and the “war on obesity” is “curvy is beautiful” with the battle cry “real women have curves”. In the inevitable arguments that follow that women who are not “curvy” are still real women, the goal, the object, the desire is STILL to be considered beautiful. To be seen as beautiful. To be accepted no matter what size, shape or weight as being inherently beautiful. But what if we as women stopped wanting to be beautiful? What if it was just not on the radar anymore? What if we were only described for who we are? What if we stopped chasing unattainable, ephemeral beauty and just allowed ourselves to be as we are, accept ourselves as we are? What if our focus was on the WHOLE of who we are, the deep, wonderful depths of our souls instead of the shape of our thighs, the lines on our face, the shine of our hair, the weight of our bodies? How much pressure would be removed? How much anxiety and shame and guilt and despair would just vanish from our lives? 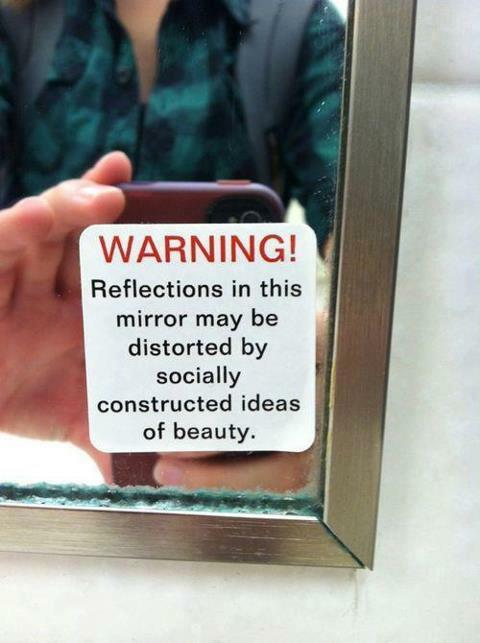 What if beauty were no longer the yardstick against which all women measured their self-worth and self-esteem? How I wonder, would the world change, would we change if who we ARE was so much more highly valued than how we look? My definition of beauty is so much more now. Beauty to me is kindness, generosity of spirit, a loving heart, courage, wisdom, patience. I no longer yearn to be physically beautiful because I know that defining myself in such a limited way ensures that I will never be good enough and even if I put my whole life into its pursuit, physical beauty is a fleeting, temporary thing. My goal is beauty of the soul. Integrity. Courage. Love. Wisdom. Compassion. To grow and stretch and be a better human being instead of a human doing everything she can to reach an impossible, marketing driven standard of photo shopped perfection. Who would you be if you stopped wanting to be beautiful? This entry was posted in Uncategorized and tagged beauty, Diets, Weight loss by dietfreebody. Bookmark the permalink.